Judith Abraham is a sculptor and mixed media artist. Her works in wax and bronze have been inspired by her love for animals. Working in wax allows her to work directly with her subjects. In these pieces she spent time in fields and barns getting to know her models. She hopes you take as much delight in them as she has. 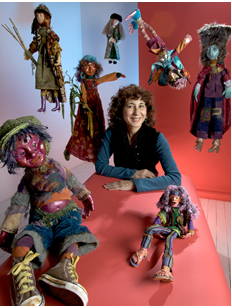 Textile artist Anne Krauss will be exhibiting mixed media dolls and puppets which incorporate found objects, clay, fabric, and encaustic wax. Her work is connected to the ancient traditions of storytelling and handcrafting objects with intention, while imbuing them with meaning. A long-time resident of Amherst, Massachusetts, Anne manages her art studio in addition to a counseling practice, which specializes in work with artists, writers, and musicians. Her work has been exhibited in galleries and museums in the United States and Japan. Several years as a designer and puppet builder for Jim Henson’s Studios in NYC inspired a lifelong love for puppetry and theatre arts. Ann McNeal’s current paintings refer to the Grand Canyon. Not as seen from the top rim, a landscape of openings created by the Colorado River eons ago. But from underneath, inside the cleft, where changes are still made, where the effort of the river is palpable, the water is vital and dangerous. Where the walls hang above and dwarf the pilgrim. Knowing that there is no way to capture the immensity and detail all at once, Ann focuses on the moods of the canyon, the sense of space, and the light. The works evoke memories of towering walls, jagged skylines, searing heat and light, and the danger of rapids. Ann traveled through the bottom of the canyon during two 8-day rafting trips on the Colorado River. Ann McNeal taught biology at Hampshire College for more than 30 years. Since then she’s been doing creative writing and painting. She has had several shows in the Valley.